The holy grail of investing is a market timing method that gets you out of the market on bad days and gets you in for the good days. There are innumerable methods for doing this, ranging from slogans, “Sell in May and Go Away” to closely guarded multi-factor proprietary algorithms. The worst methods have no apparent causal relationship between the predictor and the thing being predicted. A non-stock market example is the “Redskins Rule.” Between 1940 and 2008 if the Redskins won the Sunday before the election the party that won the popular vote in the prior election won the presidency—17 out of 18 times. After Obama’s re-election, this rule is now 17 of 19. These non-causal rules are just coincidence, if you look at enough data you will find them everywhere—and they mean nothing. Most stock market timing methods are based on price action—things like moving averages, technical chart indicators, price/earnings ratios, or pattern recognition. At least they have some sort of connection to the stock market. In a truly bearish market the short term expected volatility, typically cheaper than longer term volatility, climbs higher than the longer term value. This behavior is shared between flavors of VIX (e.g., the one-month VIX & its three-month version VIX3M), VIX futures, and the implied volatility of same strike options of different months. The chart below from VIX Central shows the progression in VIX futures prices from before the May 6, 2012 Flash Crash through the 7th. A simple metric that captures this behavior divides the short term volatility number by a longer term number. If the ratio is below one the market is relatively calm, if above one the market is especially nervous. 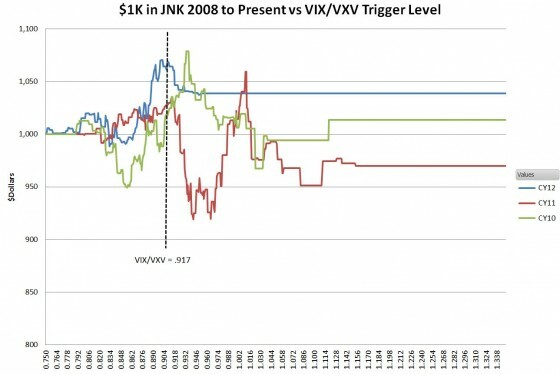 I’ve been using the CBOE’s VIX & VIX3M indexes as a convenient way to implement this volatility metric. In 2018 the CBOE changed the symbol for the 3 month calculation of the VIX from VXV to VIX3m. I have changed the text in the post to reflect that but I have not updated the charts. 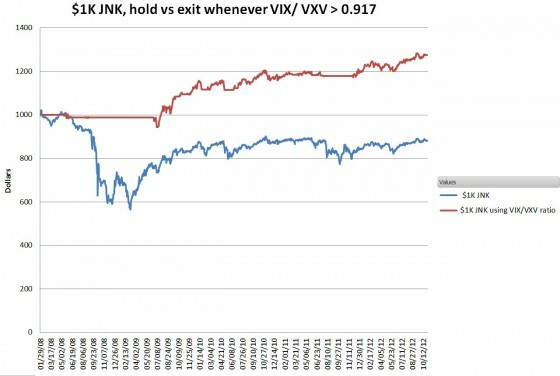 I’ve been running simulations using the VIX/VIX3M ratio as the entry / exit trigger point for market positions. The chart below shows the price performance of the speculative bond fund JNK, since its inception in 2008 compared with SPY, which tracks the S&P 500. 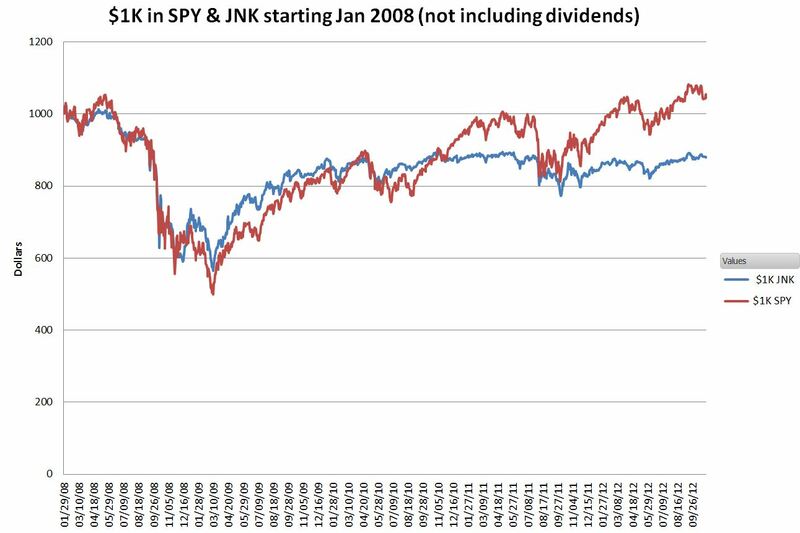 JNK’s performance would be disappointing if it wasn’t for its high dividend payouts, averaging 10% (!) per year. 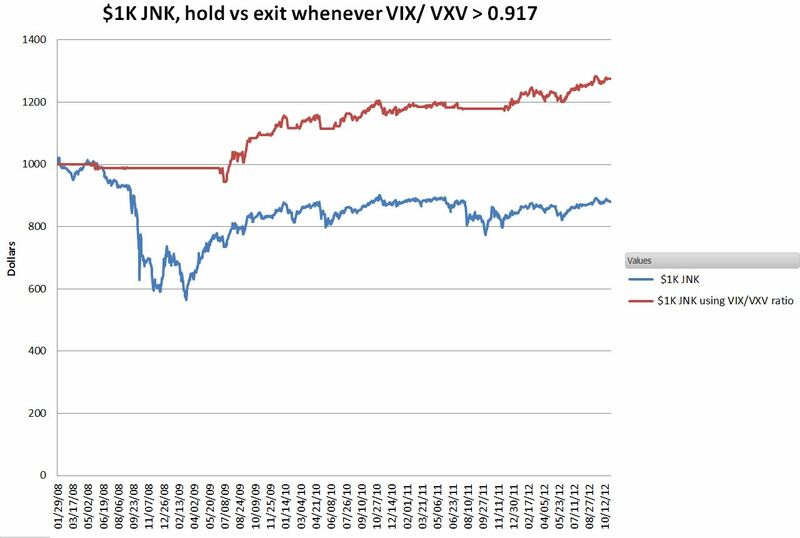 This next chart shows JNK’s performance if you had closed your JNK position whenever the VIX/VIX3M ratio at market close was greater than 0.917, re-entering when the ratio at close was below that level. This strategy would have enabled you to avoid the entire 2008/2009 meltdown, plus adding about 3% of extra performance in 2010 through 2012. Why 0.917? There’s nothing magical about it. It was just the best compromise choice over the last three years. 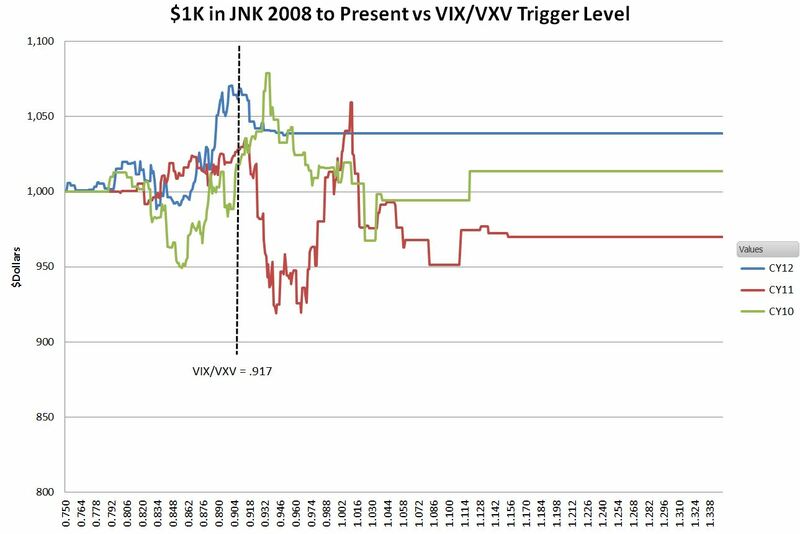 The chart below shows the performance for JNK for all realized VIX/VIX3M levels for 2010, 2011, and 2012. 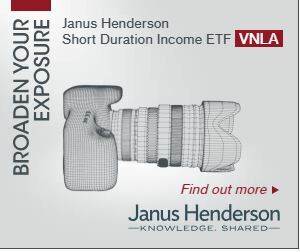 In my simulations for 2010 through 2012, this threshold worked well for high yield bond funds (JNK, HYG), high dividend funds (SDY), inverse volatility (ZIV,SVXY) and general equity (SPY). This 0.917 ratio signal worked well until late 2013. For 2014 & 2015 volatility kicked up a bit and the VIX/VIX3M ratio was a loser in determining buy/sell points. After the Brexit vote in 2016, the volatility market went into a dramatic period of low volatility that generated huge profits in the short volatility trade. The 0.917 ratio worked well but basically, anything that approached just being short volatility worked very well—until February 2018 when the sky fell. In the case of the February 5th, 2018 crash the VIX/VIX3M ratio proved to be a good predictor of problems. The ratio was well into the high .9x range and several days before the crash of the 5th.